On May 9, 2017, President Trump fired James Comey. At that point, Andrew McCabe became the acting head of the FBI and, by his own account, immediately ordered a full counterintelligence investigation of the president to determine if he represented a threat to national security. On May 17, 2017, Deputy Attorney General Rod Rosenstein authorized the establishment of an Office of Special Counsel to look into “any links and/or coordination between the Russian government and individuals associated with the campaign of President Donald Trump; and any matters that arose or may arise directly from the investigation; and (iii) any other matters within the scope of 28 C.F.R. § 600.4(a).” He hired Robert Mueller to lead this investigation. According to McCabe, Mueller then inherited the counterintelligence investigation that he had just initiated. On August 2, 2017, Deputy Attorney General Rod Rosenstein wrote a memo clarifying “The Scope of Investigation and Definition of Authority.” This memo is available to the public but in a highly redacted form. From what we can read, Rosenstein specifically granted authority for Mueller to look into Paul Manafort’s activities, including his work for former Ukrainian president Viktor Yanukovych. He also explained that his initial May 9 authorization had been “written categorically in order to permit its public release without confirming specific investigations involving specific individuals.” It will be important to understand exactly what he meant by that. On June 8, 2018, former (and now current) U.S. Attorney General William Barr wrote a letter addressed to Rosenstein and his assistant Steve Engel that made a number of questionable legal arguments, including that “Mueller should not be permitted to demand that the President submit to interrogation about alleged obstruction,” and that it’s virtually impossible for a president to obstruct justice. Mr. Barr shared this letter with attorneys representing the president, thereby putting himself on the radar as a possible replacement for Jeff Sessions who had clearly run afoul of Trump when he recused himself from the investigation into Russian interference in the election. If that was his plan, it worked. 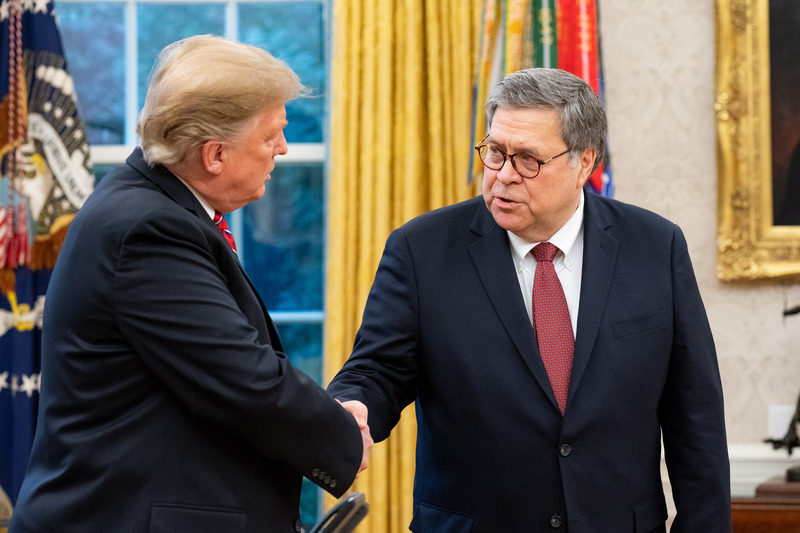 The U.S. Senate confirmed William Barr as the new attorney general in February, with 45 Democrats objecting. They tried and failed to convince Barr to recuse himself since he clearly had a conflict of interest and appeared to have been hired specifically because he was skeptical of the Russia investigation and took a very strong view on the power of the executive office. Very quickly after Barr assumed his position, rumors began to swirl that the Mueller investigation was coming to an end. Then word came out that there would not be any further prosecutions after Roger Stone. On Friday, the investigation was shut down. On Sunday, Barr released a letter he had addressed to the chairmen and ranking members of the congressional judiciary committees, Sens. Lindsey Graham (R-SC) and Diane Feinstein (D-CA), and Reps. Jerrold Nadler (D-NY) and Doug Collins (R-GA). The letter explained that some legal matters have been farmed out to other prosecutorial offices but that no further prosecutions are being recommended and none remain under seal and unknown to the public. It goes on to characterize the so-called “Mueller Report” as containing two parts. One is related to Russian interference in the 2016 election and one is dedicated to possible obstruction of justice by the president. On the first matter, Barr was able to declare that the Office of Special Counsel “did not find that the Trump campaign or anyone associated with it conspired or coordinated with Russia” during the 2016 campaign. He had nothing to say about any links between the Russians and the campaign, even though that was part of the “and/or” charge that Rosenstein originally gave to Mueller. Still, the bottom line that no one will be charged with conspiracy is significant and forms the basis for everyone is now crowing that Trump has been vindicated. Congress and the public will obviously want a thorough explanation of why none of the troubling meetings and communications we’ve learned about were considered to be part of a prosecutable conspiracy, but it is also important that Barr was to report that Robert Mueller had not claimed to have been stymied or denied in any of his requests. On the obstruction of justice half of the report, Barr wrote that “The Special Counsel states that ‘while the report does not conclude that the President has committed a crime, it also does not exonerate him. '” It’s a bit curious why a specific refusal to exonerate the president is being reported as a complete exoneration, but Barr was crafty in how he handled this problem. By not letting the public see the evidence in favor of a criminal interpretation, all we have is the fact that there is no future criminal exposure for the president from the Special Counsel. This is because less than 48 hours after having received a lengthy report, Barr determined that the president should not be charged with obstruction of justice. Given that he was auditioned for the job by making this exact argument, we should not be surprised. As you might expect, Barr uses the fact that the underlying conspiracy has not been proven to argue that the president did not obstruct justice. Importantly, Barr enlists both the DOJ’s Office of Legal Counsel and Rod Rosenstein to support his conclusion. The result looks a lot like checkmate for anyone who was hoping that the Mueller Report would lead somewhere. Note that the second bullet does not even exonerate Roger Stone, as it pertains only to the Russian government, not Russians generally or WikiLeaks or anyone else. This is important given that we know the Trump campaign knew of and encouraged Roger Stone’s coordination with WikiLeaks. What’s interesting is that no one really accused the Trump campaign of coordinating with the Russian’s Internet Research Agency and very few people argued that it was likely that anyone in the Trump campaign had any direct or significant role in the Russians’ decision to carry out hacking operations. While it’s notable that they didn’t find coordination with the Russians in the dissemination of material after it was hacked, even this is only a denial that a link to the Russian government has been established. As for whether Manafort shared polling data with a suspected Russian military intelligence officer constitutes a conspiracy, that isn’t addressed in Barr’s letter because he restricts it to a discussion of the hacked materials. He’s basically exonerating Trump for things he really wasn’t being accused of having done, and not addressing a countless of number of things that we know he or members of his team did do. Going back to Rod Rosenstein’s 2017 “Scope of Investigation” memo, he declared that the original order had been “written categorically in order to permit its public release without confirming specific investigations involving specific individuals.” My interpretation of that is that he was envisioning a counterintelligence report where sources and methods have to be protected and prosecutorial decisions are not the focus. There is no mention from Barr of any counterintelligence assessment on whether the president is or has been the subject of blackmail or external control. That is the most important thing that Congress and the American people need to understand, and Barr is silent about it. In Rosenstein’s original authorizing memo from May 2017, he asked for “any links and/or coordination between the Russian government and individuals associated with the campaign of President Donald Trump.” Where is the report on the links? The links are important because they inform any counterintelligence assessment. So, where do we go from here? The administration has had a very successful rollout thus far. The narrative that the Mueller Report has been a big dud and that Trump is vindicated is taking hold. As a purely political and bureaucratic matters, I might even be tempted to grant them victory and recommend that we all move on. Except, the president is obviously compromised in some ways, as is evident from virtually everything he says and does with respect to Vladimir Putin and Russia. This situation didn’t suddenly become acceptable because Mueller did not find prosecutable evidence of a conspiracy. It didn’t go away because Barr unilaterally did what he auditioned to do and cleared the president of obstruction of justice charges. I’d like to know how Robert Mueller and his investigative team really feel about how their work has been presented to Congress and the American public so far. I’d start by bringing them before Congress and asking them that exact question. I don’t expect Mueller to protest too loudly because that’s not the kind of man I think he is, but I do expect him to be honest and to fill out the context that we all need and deserve. Congress also needs the results of the counterintelligence investigation that McCabe initiated. We need to know how it got started, who worked on it, how Mueller handled it, how the role may have changed over time, and what conclusions they came to. On the obstruction question, it may be that Barr has the final legal say, but Congress needs all the facts because one remedy is impeachment, and another remedy is to adjust the law to better deal with future rogue presidents who are under investigation from their own underlings. Who can a president pardon or not pardon? When does firing someone to obstruct an investigation become a prosecutable crime? These things can’t be hashed out until the facts are known. The debate is really just beginning. This week Felix Sater will testify before Congress about matters he once said would end Trump’s presidency. Namely, he’ll talk about the Moscow Trump Tower deal. The president not only lied about the existence of that project but his obviously opened himself up to blackmail by the Russians by doing so. When the public learns of this in all its sordid detail, they won’t be satisfied with William Barr’s whitewash. This was all started because the one indisputable thing was that the Russians intervened in the election in ways that we’d like to prevent in the future. We know that the Mueller Report is largely dedicated to this topic, but we haven’t yet seen any of those details either. There is a lot of work to do on these subjects before we can put this all in the past and move on to the 2020 campaign.